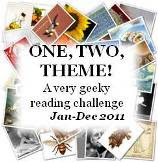 Amy of The Black Sheep Dances is hosting the Eastern European Reading Challenge in 2011. I imagine that most of my books will come from my own country, Poland, and that's perfectly ok with me. I didn't read a single Polish book in 2010 and that makes me sad.